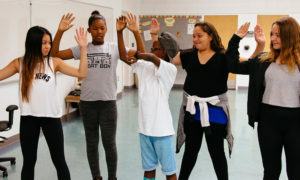 Beat Box Dance Academy preserves original hip-hop dance styles through arts education. Our performing arts based program is intended to provide schools and/or other youth-oriented organizations with a quality hip-hop dance curriculum. We achieve this by providing in-depth instruction on popular hip-hop styles such as breakdancing, popping and locking, house, grooves, and more. In addition to participating in high energy and exciting classes, students work side by side other students to assist in creating their own dance pieces with the help of our amazing dance staff. By doing so our students learn how to use resources provided to be confident leaders and creative artists!